India’s ambitious development agenda involves facilitating investment for economic growth, infrastructure development, and social progress. Yet, thousands of investment projects have been stalled to date, raising red flags for the health of the country’s financial regulatory systems, public sector banks, and investment community. While official reasons given for stalled projects remain opaque, deep contestation leading to conflict on public (and private) lands must be better understood as a substantive risk to investments. An improved understanding of the actual causes of stalled projects will not only help investors, financial institutions and regulators make better decisions, but also inform public policies regarding communities’ property rights and provide a path to more inclusive development. 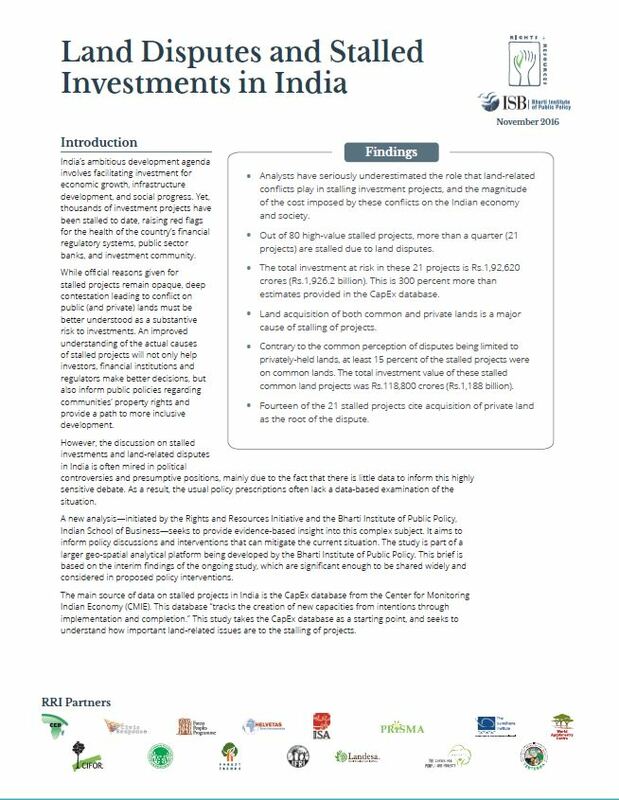 This new analysis—initiated by the Rights and Resources Initiative and the Bharti Institute of Public Policy, Indian School of Business—seeks to provide evidence-based insight into this complex subject. It aims to inform policy discussions and interventions that can mitigate the current situation. The study is part of a larger geo-spatial analytical platform being developed by the Bharti Institute of Public Policy. This brief is based on the interim findings of the ongoing study, which are significant enough to be shared widely and considered in proposed policy interventions. The main source of data on stalled projects in India is the CapEx database from the Center for Monitoring Indian Economy (CMIE). Analysts have seriously underestimated the role that land-related conflicts play in stalling investment projects, and the magnitude of the cost imposed by these conflicts on the Indian economy and society. Out of 80 high-value stalled projects, more than a quarter (21 projects) are stalled due to land disputes. The total investment at risk in these 21 projects is Rs.1,92,620 crores (Rs.1,926.2 billion). This is 300 percent more than estimates provided in the CapEx database. Land acquisition of both common and private lands is a major cause of stalling of projects. Contrary to the common perception of disputes being limited to privately-held lands, at least 15 percent of the stalled projects were on common lands. The total investment value of these stalled common land projects was Rs.118,800 crores (Rs.1,188 billion). Fourteen of the 21 stalled projects cite acquisition of private land as the root of the dispute.